In summer 2016, our planet experienced record-breaking temperatures, accompanied by some of the most intense heat waves in recorded history. During the month of June, cities in many parts of the southwestern United States – including Burbank and Death Valley, California – experienced temperatures 10-20ºF hotter than average (109-126ºF). In July, temperatures in two Middle Eastern cities – Mitribah, Kuwait and Basra, Iraq – reached the highest levels ever recorded in the Eastern Hemisphere (129.2ºF and 129.0ºF). The summer rounded out with heat waves striking northeastern U.S. cities. Philadelphia experienced the most 90-degree days in its recorded history, making it that city’s warmest August on record, and Washington, D.C. experienced its second-hottest summer on record, with consecutive 100-degree days and a record number of 90-degree days. Climate change debates aside, many local governments and urban communities are understandably concerned about the impacts of these heat waves and overall temperature increases. In major cities like New York, some of the most urgent concerns center around impacts on human health, human well-being and damage to or suspension of crucial energy services. As with most challenges humanity is facing these days, the impacts of extreme heat are not experienced equally by all people in all places. Who suffers from extreme events is a function of cumulative risk factors – determined by geography as well as personal and household preconditions. But these risk factors are not the whole equation. Community-based institutions that mobilize local collective action can provide ways to cope during times of crisis and activate long term adaptation and mitigation strategies. This is why a major focus of WE ACT’s Climate Action Plan is on adapting to hotter conditions in Northern Manhattan. People are exposed to extreme heat when summertime weather is hot and humid relative to historic baselines. Dramatic temperature spikes can be a driver of heat-related morbidity and mortality, as can small differentials between day and nighttime temperatures; when temperatures remain unusually high while we are sleeping and our bodies trying to recover from the heat of the day. Because these events are extreme relative to normal conditions, individuals, households and communities are often unprepared to cope with their impacts. Cities are hotter than their country cousins. Cities experience higher daytime temperatures and less nighttime cooling than surrounding (peri-urban) areas – a phenomenon known as the urban heat island effect. A number of different factors account for this urban/peri-urban difference. For one, cities tend to consist of larger amounts of concrete, asphalt, and other materials which have thermal properties that facilitate concentrations of heat. Secondly, rural and peri-urban areas tend to have more trees, vegetation and soil than do relatively urbanized areas. Through processes of evaporation and evapotranspiration, these landscape elements provide a cooling effect. Water evaporates from surface waters and from water that has infiltrated into soil (evaporation), cooling the air as it does. Similarly, vegetation such as trees absorb water through subsurface roots and release it into the air through their leaves (evapotranspiration). Impervious surfaces like asphalt roads – which do not allow water to filtrate into the soil and be taken up by roots of plants – inhibit these processes of evaporation and evapotranspiration. Third, the shape of the urban built environment, or what is known as “urban geometry,” can create concentrations of heat. High rise buildings reduce wind flow, and urban canyons can cause air stagnation, creating concentrations of both high temperatures and pollution. Ever since 2008, our global population has been mostly urban. By 2050, urban populations will make up 70-80% of the world’s total population (United Nations, 2014). These urbanization trends and accompanying increased densities of people and built materials will only compound the urban heat island effect unless we begin to design our cities differently. What threats are posed by urban heat island? In the United States, heat is the leading weather-related killer (Klinenberg, 2002; U.S. Environmental Protection Agency, 2014). High temperatures become dangerous to human health when people have difficulty maintaining their internal body temperatures. This condition can lead to heat cramps, heat exhaustion or heat stroke, and can impact other health problems, such as circulatory or respiratory diseases. While direct heat-related health and human comfort impacts are among the most immediate concerns, extreme heat events are also problematic for energy consumption, air quality and water quality. As temperatures rise, so does energy demand, which in turn leads to increased fossil fuel consumption. Ultimately, increased fossil fuel consumption reinforces climate change, thus reinforces extreme weather events, and thus reinforces our ever-growing reliance on fossil fuels. In addition, higher electrical demand increases air pollution emissions, and higher temperatures enhance ozone formation and evaporative emissions. Rising air and surface temperatures are also affecting water quality. As water bodies heat through contact with air and as storm water runs off hot surfaces, “thermal pollution,” or rising water temperatures are making water bodies less habitable for some aquatic life. Within urban heat islands, there are more islands. So on average, cities tend to be hotter than the less dense and built-up places that surround them. However, not everyone who lives in a city experiences the urban heat island effect in the same way. Temperature variation within a given city can be even greater than the average temperature difference between that city and its surrounds. Exposure to extreme heat is largely driven by conditions of the built environment and these conditions vary considerably across urban landscapes. Midtown and lower Manhattan are characterized by dense high-rise buildings which, in some areas, form urban canyons. Neighborhoods like Forest Hills, Queens have single family residential homes and substantial tree canopy. Sections of Park Slope, Brooklyn are comprised of midrise buildings adjacent to green, open spaces and urban forests of Prospect Park. The various compositions of landscapes and built environments that we find throughout New York City have different temperature signatures (Hamstead et al., 2015). Areas of the city that are hot relative to the city as a whole are known as micro-urban heat islands. People who live in micro-urban heat islands are disproportionately exposed to heat-related health risks. Not only are people who live in cities exposed to heat differently, but even those who are similarly exposed to hot conditions are not necessarily impacted by those conditions in the same way. People with physical, mobility or economic constraints can be disproportionately sensitive to heat-related health impacts, as can those with cognitive impairments or those living in social isolation. In New York City, recent studies have found that Census Tracts with high proportions of African American and economically-constrained populations tend to have relatively high levels of heat-related mortality (Madrigano et al., 2015; Rosenthal et al., 2014). Mapping illustrates distributions of risk. City governments including New York have begun to recognize that extreme heat is an increasingly dangerous threat to urban residents. Yet, unlike hazards such as floods and storm surges which are commonly studied by agencies like the Federal Emergency Management Agency in the U.S., communities often lack basic knowledge of where extreme heat threats are likely to have the most impact, and who is most likely to be affected. This is why WE ACT for Environmental Justice and the Natural Resources Defense Council are working to map the geographic distributions of heat exposure and heat sensitivity in Northern Manhattan. Temperatures in Northern Manhattan tend to be cooler in such areas as those surrounding Inwood Hill Park and Fort Tryon Park, and hotter in areas like the 207th Street rail yard where built infrastructure dominates and green space is lacking. Fig. 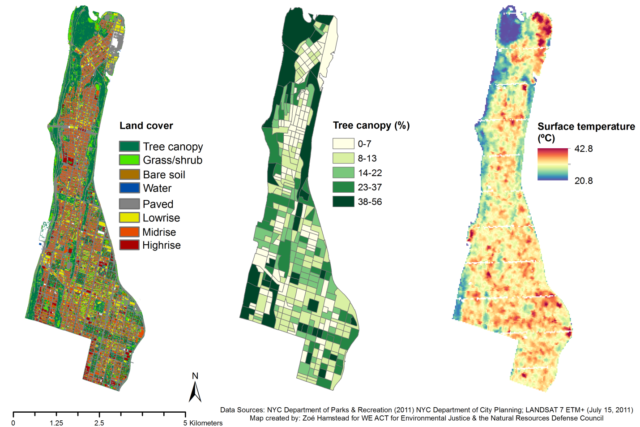 1: Distribution of exposure to heat across Northern Manhattan reflected by land cover, percent tree canopy (at the Census block group-level) and surface temperature. But urban landscapes are not the only factor driving heat-related health risk. Other factors like poverty and social isolation can contribute to risk. In some cases, people who are sensitive are concentrated in areas of cities – for instance, of the four neighborhoods in Northern Manhattan, Central Harlem has the highest concentration of Black/African Americans. Fig. 2: Distribution of Blacks/African Americans in Northern Manhattan as a whole, and for each community district – East Harlem, Central Harlem, Washington Heights and Inwood. Fig. 3: Distribution of individuals earning incomes below the poverty line in Northern Manhattan as a whole, and for each community district – East Harlem, Central Harlem, Washington Heights and Inwood. People who experience multiple forms of risk – such as people of minority race status who are also living in poverty in communities that lack tree canopy – can be particularly vulnerable to heat-related impacts. By identifying neighborhoods with concentrated and multiple risk factors, we can focus risk reduction interventions where they are needed most. Fig. 4: Distribution of overall vulnerability measured by exposure to surface temperature, percent tree canopy and sensitivity based on age (>65 years) and income (below poverty level) in Northern Manhattan as a whole, and for each community district – East Harlem, Central Harlem, Washington Heights and Inwood. How can we beat the extreme heat? How can we adapt to rising temperature and the increasing frequency and intensity of extreme heat events? For one, we can incorporate landscape features which reduce exposure to extreme heat into the urban built environment. Urban greening – planting trees and vegetation – as well as ‘blue-ing’ and ‘turquoise-ing’ (Childers et al., 2015) – increasing access to surface waters, restoring wetlands and daylighting underground streams to above-ground channels – will help to cool air temperatures through processes of evaporation. Increasing water infiltration through green roofs, porous paving and other green infrastructure will promote cooling through evapotranspiration. These kinds of public investments have numerous benefits beyond moderating temperatures – particularly if they are designed in such a way that enable people to access and use them for recreation or other kinds of activities. We can also build community capacity to respond in the event of an extreme heat threat. By developing emergency response protocols for nursing homes, public housing and other residential communities that are especially at risk, we can develop ways for people to better access the resources they may need in the event of a hazard. Other public investments – such as cooling centers and community spaces with air conditioning – can be strategically located in areas with concentrations of people who may be at risk. Perhaps most importantly, urban communities need robust processes of democratic participation that enable people whose voices are often left out of planning processes to engage in public decision-making and help steer public investment where it is needed the most. The fact that risk of injury due to extreme heat (among other threats) is not evenly distributed across social groups is emblematic of deeper structural inequality, embedded in our systems of governance and economy. Differential access to crucial resources like health care, healthy living conditions, high quality education, and robust social networks are reinforced through decision-making processes. Only when we engage in collaborative planning processes of mutual learning and action – such as vulnerability assessments that are co-produced by local communities and city agencies – will we identify solutions for protecting people who are most at risk. That is because during crises, communities with engaged and self-empowered citizens supported by social institutions fare better, often regardless and in spite of geography and socio-economic status. Yet, our decision-making processes tend to be democratically-weak at best, and authoritative at worst. As anthropologist David Graeber notes in The democracy project, even when opinions are shared by a majority of Americans (let alone stem from pluralist or minority values) they can be entirely left out of mainstream political discourse (2013). Direct, participatory democracy through techniques such as collaborative community design is necessary to address societal problems whose impacts are disproportionately felt: climate change, poverty, energy dependence, employment access, extreme weather events, and the like. City agencies, civil societies, and citizens – informed by the expertise of engineers, climatologists and others – can collaboratively develop effective mitigation and adaptation strategies in urban communities like Harlem. Dr. Zoé Hamstead is an urban ecologist and Assistant Professor of environmental planning at the University at Buffalo School of Architecture & Planning. Her research and practice focus on urban resilience and sustainability planning in the context of climate change. Graeber, D., 2013. The democracy project: A history. A crisis. A movement. Penguin Books, London, UK. Klinenberg, E., 2002. Heat wave: A social autopsy of disaster in Chicago. University of Chicago Press, Chicago. U.S. Environmental Protection Agency, 2014. Climate change indicators in the United States: Heat-related deaths.